On this date in 1899, Ernest Hemingway was born in Oak Park, Ill., so here's a post in honor of this great writer and polydactyl-cat lover. I don't know many people - or perhaps any, come to think of it - who'd want to slip into Ernest Hemingway's shoes. But evidently some businessman thought there would be a market for it. And so, I present to you the Ernest Hemingway Footwear Collection. 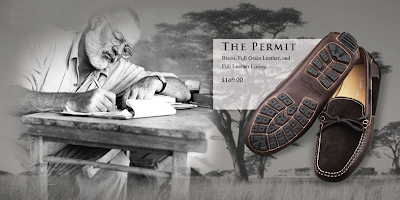 Ernest Hemingway Footwear Co. is a premium brand of men's classic hand crafted casual footwear, inspired by Ernest Hemingway's colorful life, writings and travels. In following his footsteps through Spain, Paris, Cuba, Africa, Key West, Canada, and of course, Sun Valley, we've collected styles that pay tribute to his experiences. Carefully held and hand sewn by artisan craftsman in South America, these shoes are made of the finest leathers, including American bison. We work to offer an elegant refinement to the hand crafted casual footwear for the man who appreciates authentic American quality and style. Shoes made from American bison not your thing? Don't worry; there's also the Ernest Hemingway Furniture Collection, the Ernest Hemingway Pillow Collection and, coming soon, Hemingway Hotels and Resorts. i really, really wish I were kidding.